Showing results for tags 'Zecora'. A thick green fog rolled across a hill near Ponyville. Soon a figure emerged dressed in a black robe with a black pointy hat. Although a convincing costume, one could tell it was Zecora. The Zebra at first didn't know what to dress as for Nightmare Night, but then she remembered how many ponies referred to her as an Evil Enchantress. So with some green makeup and the right clothes, Zecora looked like a wicked witch from a pony tale! "Gather around all who dare, for tonight I have a creepy story to share! And if you are lucky to survive my tale of woe, then perhaps you can continue this little show. For if you have a scary tale to tell, then hope you will share it as well!" First a few rules 1: Medical cures only, no relationship advice or other personal problems 2: Unique clever and funny health problems encouraged. 3: Wait till after RiverHippo's Post before joining Zecora had quickly realized selling her potions in her small hut wasn't going to work! It was too cramped and ponies seemed to get lost! So filling up a cart with some of her bottles and vials, and pouches of several herbs and cures Zecora set out for PonyVille Market to set up shop. Once there she quickly threw together a small booth with her cart right behind so that she could easily access anything she needed. "Oh dear I still fear I do not quite belong here" She muttered to herself quietly, feeling a touch uncomfortable being out in the open, but she was starting to calm down, though wasn't sure if her homemade remdies would be of much use out here... "Perhaps all I need is a boost, though this was easier in my youth" She chuckled shaking her head trying to stop psyching herself out like this! Ponyville was full of her friends and she needed to remember that...though sometimes she forgot to remind herself of this fact. Though sometimes it was very hard to do! Ugh she wished she had a little more confidence in herself! She was usually very confident and didn't have this problem usually but she felt strange today, perhaps it was something she ate? 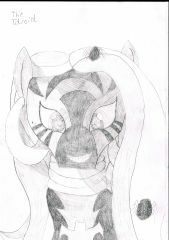 BrightEyes the grey fox she had gotten from Fluttershy was perched on her cart and yawned looking bored already...her cast was off and she hopped down rubbing against Zecora's leg "Oh Bright Eyes Do not tickle me, We'll have customers soon.. you'll see" She said smiling ruffling the fox's head fur gently. Recently i've been thinking Zecora appeared in two episodes in Season 1 (Bridle Gossip and Swarm of The Century) and three episodes in Season 2 (Luna Eclipsed, Cutie Pox and Secret of My Excess) if the trend continues then in Season 3 she'll appear in four episodes. Who besides me thinks this will happen? FiM Toys for 2012 - Did Hasbro listen to the fans at last? Zecora was so happy, and really ready for what was to come today. 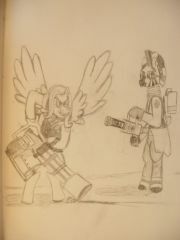 As Zecora could see Canterlot in the distance, today was going to prove interesting indeed. Zecora was not 100% sure on this point, but it could be the first time any zebra had been in Canterlot. 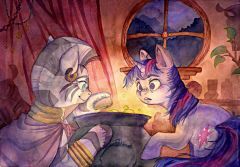 But for Zecora the chance to see how things in Canterlot worked was a golden opportunity. Heads turned, ponies gazed and a few ponies dropped what was in their mouths, as all were stunned to see what was coming down the street. Zecora walked into Canterlot with a little bit of doubt, Zecora knew that she would turn a few heads, but not all of them. “What is this I see, every single pony is looking at me, seems I can’t go about my shopping in peace”. Zecora was in town to do some shopping for ingredients she needed, most of which were rare herbs and plants she could not acquire in the Ever Free Forest. So Zecora was going to spend a day or two in Canterlot, she also wanted to see the capital of the ponies, as this could prove to be a valuable cultural exchange. But with every pony starring at her like this, could she do anything normal in Canterlot. 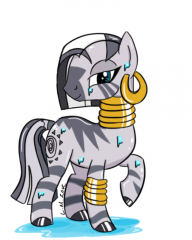 Well Zecora is about to find out as she starts heading for the shops, to start gathering all the items on her list.